In recent years, scholars have started to draw on upper echelons theory to analyze the relationship between the characteristics of top managers and management accounting and control systems. This short survey paper aims to give an overview of upper echelons theory and its current applications to management accounting and control research. The paper shows that existing research consistently finds that younger and shorter-tenured CFOs and top managers with business-related backgrounds are associated with more innovative and/or sophisticated management accounting and control systems. In contrast, the (sparse) extant results on CEO characteristics and on characteristics of top management teams are somewhat contradictory. 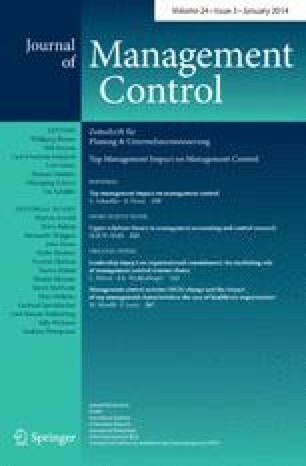 The paper concludes with an outlook on fruitful future research avenues, which include the analysis of additional management accounting and control systems and additional upper echelon characteristics, moderators such as managerial discretion and executive job demands, and the combined effect of upper echelons and management accounting and control systems on organizational performance. The author thanks two anonymous reviewers for their most helpful comments and Ingrid Abfalter for her outstanding assistance in language editing. Lee, J., Elbashir, M. Z., Mahama, H., & Sutton, S. G. (2013). Enablers of top management team support for integrated management control systems innovations. International Journal of Accounting Information Systems. doi: 10.1016/j.accinf.2013.07.001.